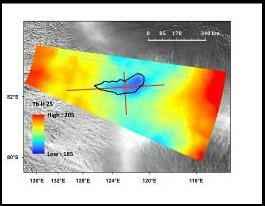 ESA SMOS brightness temperature data showing Tb anomaly over Lake Vostok, Antarctica. The lake (outlined in black) is overlain by almost 4 km of ice. Existing space and airborne remote sensing instruments have pushed the state-of-the-art in the characterization of ice sheet behaviors with the exception of one key parameter: internal ice sheet temperature. The Ultra- wideband Software-Defined Microwave Radiometer (UWBRAD) will address this gap and provide researchers with the capability to measure ice sheet internal temperatures at depth. This data will enhance the research community’s ability to determine the ease at which ice deforms internally and the rate at which the ice sheet flows across its base. It will also enhance the community’s ability to compile mean annual temperatures and monitor climate change; other potential applications include the measurement of deep surface soil moisture as well as snow thickness. UWBRAD is the product of modeling studies and research activities, including analyses of key science results from ESA’s 1.4 GHz Soil Moisture and Ocean Salinity satellite microwave radiometry data that probed deep ice sheet properties at Lake Vostok, Antarctica. These research and technology development activities have confirmed that (1) relative changes in ice sheet internal temperature can be gleaned from multi-frequency emission data over the range 0.5 to 2 GHz, and (2) a multi-frequency radiometer has the potential to separate temperature and electromagnetic properties in the ice sheet through a model-based retrieval approach. Today, there are many radiometers operating in the protected portion of L-band that provide only partial ice sheet temperature information due to their single frequency measurements. In contrast, UWBRAD will provide brightness temperatures in 15 channels over the ultra-wideband 0.5-2GHz range and in environments containing radio frequency interference (RFI). To enable operations outside the protected portion of the spectrum, UWBRAD incorporates full bandwidth sampling with software defined algorithms to provide real-time detection and mitigation of interference and a cognitive radiometry method for locating and utilizing portions of the spectrum free of RFI. The initial design of a 0.5-2 GHz antenna commensurate with instrument and science requirements and capable of airborne deployment has also been completed. UWBRAD will (1) push the state-of-the-art for ultra-wideband software defined microwave radiometers and antennas; (2) provide NASA and the research community with a capability that can be adapted for use on a variety of aircraft with a path to operation in space; and (3) address key NASA climate variability and change issues including the determination of mechanisms that control the mass balance and dynamics of ice sheets of Greenland and Antarctica and the parameterization of predictive models of the contribution of land-based ice to sea level change. UWBRAD is a collaboration between OSU, UC-Boulder, U. Washington, and the Institute of Applied Physics.